On a crisp winter night, my wife, Renee, and I peer out from behind the curtains of our corner suite in Baker City’s Geiser Grand Hotel to find two black draft horses blowing plumes into the cold air in the wide street below. In the driver’s seat of the carriage behind them sit a pair of men in cowboy hats. Have we inadvertently stumbled upon the set of “Deadwood,” the HBO series set in a real-life gold rush town much like Baker City? Nope. It’s just Friday night at our fantastically renovated 19th century hotel, and our ride is here. 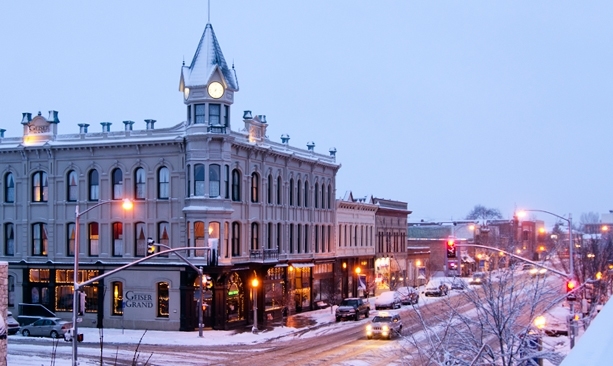 The sleigh takes our group of bundled-up guests through the Christmas-lit streets of the town, while Geiser Grand owner Barbara Sidway points out some of the more outstanding architectural highlights — the matching Italianate architecture houses that a pair of Eastern sisters demanded in return for marrying two Baker City merchants; the Cathedral erected from volcanic tuff; the old hospital recently converted to upscale condos; the Carnegie library; and the historic courthouse with its eternal flame burning to honor residents lost in World War I. This town has more than 100 buildings on the National Register of Historic Places. 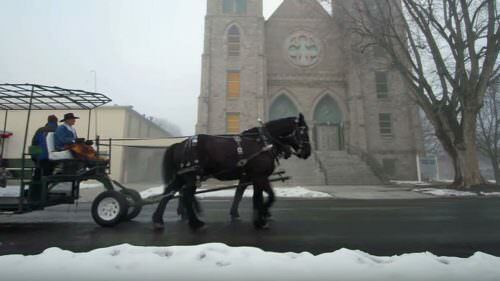 As the horses clop down streets built wide enough to turn a mule team around in, Sidway describes what the city was like more than a century ago: a booming frontier town built on the mining of gold, silver and copper, and the moxie of 300,000 pioneers who passed through — or stayed — on their journey along the Oregon Trail. The dusty outpost featured two opera houses back then, and tuxedoed waiters served Maine lobsters in the restaurants. Bordellos lined the streets and card games grew rowdy in the rooms upstairs, full of men who were hitting it rich in the mines, cutting timber or raising livestock. and Poland to recreate the hotel’s dramatic atrium. 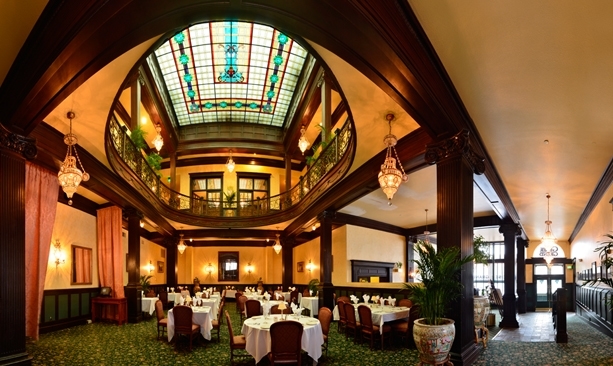 The 1889 Saloon at the Geiser Grand Hotel serves dinner, drinks and snacks. The newly updated rooms at the Geiser Grand Hotel belie an elegance of another time. 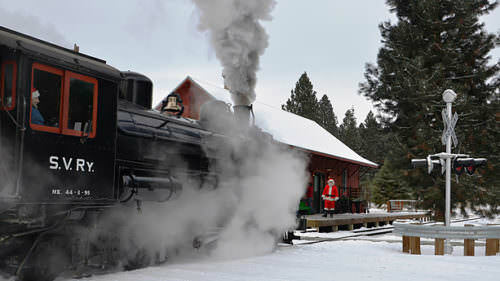 The 40-minute horse-drawn tour ends beside the Powder River, at a house blazing with Christmas lights and a bonfire roaring in the yard. Our band of travelers can imagine that we’re migrating across the continent together and passing a chilly night before moving on tomorrow toward Portland. Some music — plus s’mores and hot chocolate for the kids — helps to set the scene and further enhance the festive feeling on this frosty evening. Renee and I soon discover that dinner in the three-story atrium of the Geiser Grand is the perfect follow-up to the sleigh ride and bonfire. 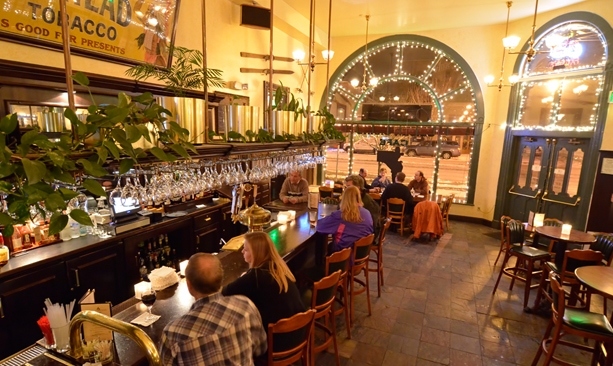 The restaurant specializes in locally raised beef and boasts an impressive wine list. Chef Pedro Cabralles Torres is homegrown; his first job at the hotel was installing the stained glass window three floors above the dining room because nobody else on the renovation crew was comfortable working above such a big, open drop. He applies the same level of enthusiasm to the cuisine. 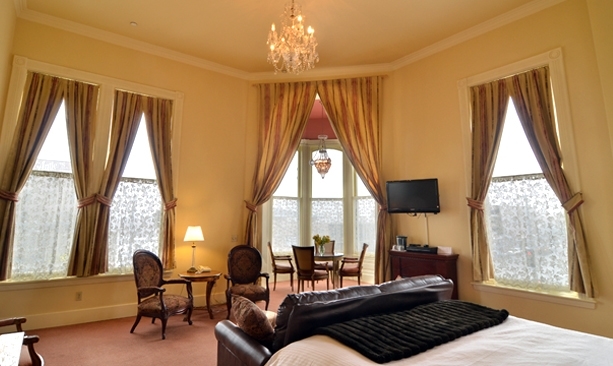 The Geiser Grand Hotel was first opened in 1889 and has been recently restored to its old glory. 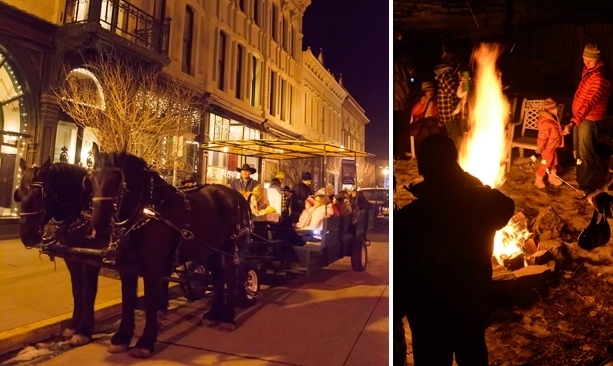 A winter sleigh ride starts at the hotel and ends with a bonfire on the Powder River. Although the Geiser Grand is a destination in itself, the town of Baker City also boasts wonderful shops — such as Bella, stocked with kitchen goods and gourmet foods you’d expect to see in New York or San Francisco, including wine from Oregon, Spain, Portugal and Italy; sake and tiramisu; organic produce and grass-fed beef; and fantastic selections of cheeses, candy and other palate-tempting treats. 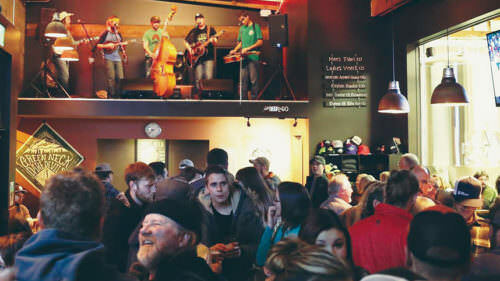 Just down the street, Barley Brown’s Brew Pub is garnering international attention. Its unassuming exterior houses a warm warren of brick and oak, where a friendly staff serves a variety of pub fare, Italian specialties and one of the best beer portfolios I’ve had the pleasure to sip. I ordered the sampler of nine two-ounce pours, and favorites included a peaty Whisky Malt Ale and the Cerveza Negra Caliente, basically the beer version of chocolate with chili peppers — a dark blonde ale brewed with fresh jalapeños. 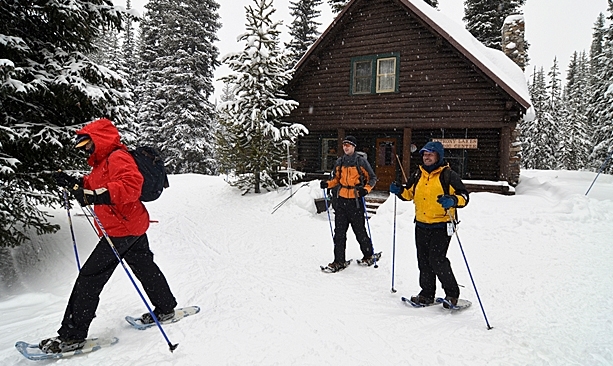 Farther afield, outdoor lovers will find downhill and cross-country skiing and snowshoeing at the much-loved Anthony Lakes Ski Area and other locations. In the summer, there’s hiking, boating and gawking in Hells Canyon. No matter which activity you choose, you’ll be embraced by comfort and elegance in the historic Geiser Grand when you return for the evening. and 11 kilometers of snowshoe and singletrack skiing. 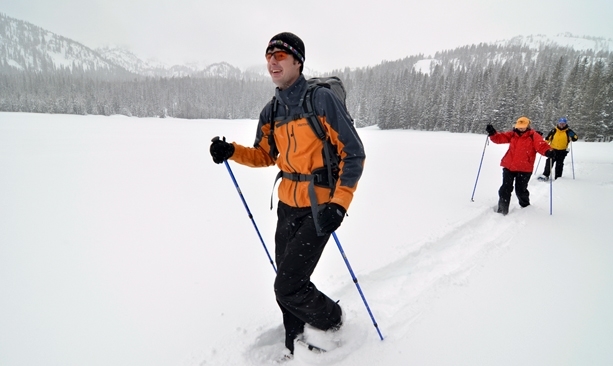 Snowshoeing at Anthony Lakes Nordic Center near Baker City puts you right in the heart of winter’s beauty.